Witching Hour #16 COVER Original BRONZE comic art Nick Cardy DC Horror 25c. 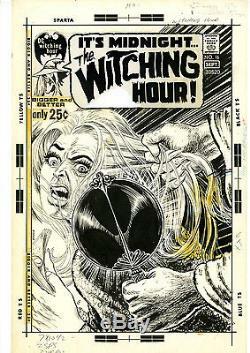 This original hand drawn comic art by Nick Cardy is the cover from the Witching Hour, issue 33. This is a great 1970s horror cover. It measures approximately 17 1/2" x 11 1/2". Scroll Down For More Pictures Below....	We take pride in packing all the orders we receive carefully. THIS IS NOT WHAT WE DO.... All orders, no matter what the price of the item, gets boutique professional packing treatment. Boxes will be able to be used unless discussed prior. INTERNATIONAL packages ARE NOT FREE! Some of these services are not the cheapest, but they are the fastest and safest. The shorter the time a package is in transit, the lesser the chance for a problem to occur. The item "Witching Hour #16 COVER Original BRONZE comic art Nick Cardy DC Horror 25c" is in sale since Sunday, July 31, 2016. This item is in the category "Collectibles\Comics\Original Comic Art\Covers".